Practicing a religion in a modern world could be a challenge in and of itself but being refused a job or promotion because of your religious views is an unfair and illegal practice. Unfortunately, many people of different religious faiths still face religious discrimination at the workplace. Remember: you cannot be denied a job or have any other adverse action taken against you because you practice a certain religion or don’t practice any religion at all. If you have faced religious discrimination on your job, you should contact a religious discrimination attorney and get a free consultation. Religious discrimination occurs when an employee is treated differently based on their religious preference. It is illegal to treat employees differently because of their religion. “Religion” includes spiritual or religious beliefs that are not associated with an organized church or other group, and can include atheist or agnostic beliefs. Employers may not refuse to hire people because of their religious beliefs or treat them differently than other employees with respect to assignments, discipline, promotions, pay, or benefits because of their religion. Sometimes, an employee may only be perceived to be of a certain religion — e.g., their employer or colleague believes they ‘look Rastafarian’ — when in fact they aren’t. In such cases, the employee is still protected against discrimination based even on a perceived religion. Experienced religious discrimination lawyers at the Law Office of Yuriy Moshes, P.C. can protect you from unlawful discrimination based on your faith. Disparate Treatment: Employers may not treat employees and/or applicants differently regarding any aspect of employment (including recruitment, hiring, assignments, discipline, promotion, and benefits) based on their religious beliefs or practices. Religious-Based Harassment: Employers may not subject employees to harassment because of their religious beliefs or practices. Religious-based harassment occurs when an employee is required or coerced to change a religious practice as a condition of employment, or subjected to unwelcome statements or conduct that is based on religion. What is a Religious Accommodation? Employers are required to accommodate an employee’s religion/religious practices/religious observances. This means that the law requires adjustment to the work environment that will allow the employee to practice his religion. Flexible scheduling, voluntary substitutions or swaps, job reassignments, lateral transfers, and dress code adjustments are examples of ways an employer can accommodate an employee’s religious beliefs. Employers must provide these accommodations (adjustments) unless the requested accommodations impose an “undue hardship” to the business. In evaluating whether a requested accommodation poses an undue hardship, courts will consider the type of workplace, the nature of the employee’s duties, the identifiable cost of the accommodation in relation to the size and operating costs of the employer, and the number of employees who will in fact need an accommodation. However, employers sometimes refuse to provide reasonable accommodations for no reason at all. If your employer actively interferes with your religious practices, it is better to get a free religious discrimination lawyer consultation to determine if your employer has a legal reason to deny the request. Can Someone be Fired for His or Her Religious Beliefs? 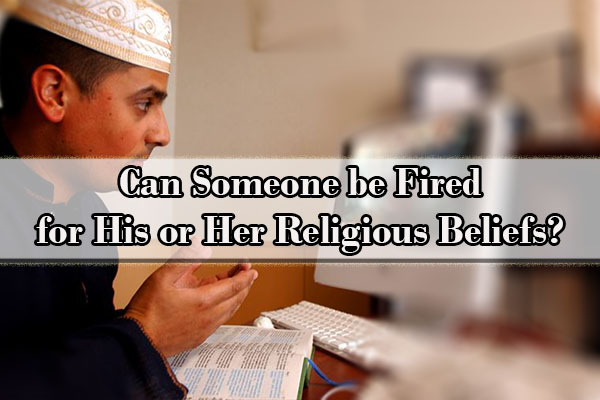 It is important to understand that it is illegal to fire someone due to his or her religious beliefs. If your employer says he is going to fire you or refuse you a promotion because of your religious beliefs or lack of them, you should immediately contact religious discrimination attorney. It is illegal for an employer to refuse to hire a potential employee based on that potential employee’s religion rather than the skills and work experience of the potential employee. If you apply for a position and your potential employer asks you about your religious beliefs and then refuses you a position with no reason, chances are you are facing a case of illegal religious discrimination. Contact a religious discrimination attorney to learn more about your rights under the law. You applied for a job but were rejected in favor of a less qualified applicant because you are Muslim, and your potential employer prefers a Christian applicant. You are an observant Jew and your employer forces you to work a Saturday shift even though you notify your employer that you are unable to work on Saturdays as a result of your religion. Your colleagues make constant jokes about your religion, rituals you observe, your clothing, and otherwise harass you in other ways because of your religious beliefs or lack of them. Remember: Religious discrimination can take many forms and sometimes it is not so obvious. If you feel that your employer has discriminated against you based on your religious beliefs, contact an employment discrimination lawyer to make sure your rights are not being violated. The federal law that protects employees from religious discrimination in the workplace is Title VII of the Civil Rights Act of 1964 (“Title VII”) and covers all private employers, state and local governments, and educational institutions that employ 15 or more individuals. Title VII prohibits employers from discriminating against individuals because of their religion (or lack of religious belief) in hiring, firing, or any other terms and conditions of employment. Title VII also prohibits religious harassment of employees, such as offensive remarks about a person’s religious beliefs or practices. Under Title VII, religious harassment is unlawful when it is so frequent or severe that it creates a hostile work environment or when it results in an adverse employment decision (such as being fired or demoted). The only exception to Title VII’s religious discrimination provisions is if your employer is a religious organization or a religious educational institution. The Equal Employment Opportunity Commission (EEOC) is the agency of the federal government responsible for investigating charges of job discrimination based on religion in workplaces of 15 or more employees. In New York, under Title VII, an employee must file a charge of discrimination with the Equal Employment Opportunity Commission (“EEOC”) within 300 days of the most recent discriminatory act. Once a Notice-of-Right-to-Sue is received from the EEOC, an employee must file his or her lawsuit within ninety (90) days. The New York State Human Rights Law (“NYSHRL”) and the New York City Human Rights Law (“NYCHRL”) also forbid any form of discrimination based on religion in the workplace and protect employees working for businesses employing four (4) or more people. Under the NYSHRL and the NYCHRL, an employee must file a claim in court within three (3) years of the last discriminatory act. If you are discriminated against due to your religion or denied an accommodation for your religious practices, know that you are protected under the law. Contact the religious discrimination lawyers at the Law Office of Yuriy Moshes, P.C. to learn your options. What to do if you Face Religious Discrimination in the Workplace? Collect any religiously discriminating statements made by the employer. If the statement comes in written form such as in a letter or an email, keep it. If the evidence is based on an oral statement, do your best to remember it word-for-word and write it down as soon as you can. The best practice in such a situation is to type the statement electronically in some form that has a time stamp such as a text message so your religious discrimination attorney can prove the time and place in court. Photograph any discriminatory images, displays, or cartoons that indicate possible religious discrimination. Research your employer’s complaint procedure and complain about the discrimination pursuant to that procedure. You have to give your employer a chance to fix the situation and put an end to the religious discrimination. Make sure you follow your employer’s complaint procedure, if there is one, and report the discrimination to the correct person. It is always best to put your complaint in writing. If you’ve only complained verbally, make sure you follow up in writing confirming the fact that you complained and reiterating the subject of that verbal complaint. Furthermore, provide the person to whom you’re complaining with copies of all the evidence you’ve accumulated. Remember, the employer doesn’t have to fire the person discriminating against you or inform you of the results of any investigation. They only have to make the discrimination stop. Keep records of all mental health treatment that you received as a result of the religious discrimination. Remember that it is also illegal to take any retaliatory action against an employee for complaining about religious discrimination. 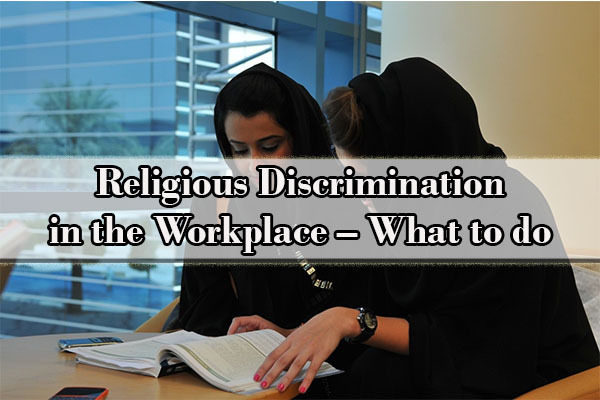 What are the Remedies Available for Victims of Religious Discrimination in the Workplace? Punitive damages (used to punish employer who committed an exceptionally reckless or malicious act of discrimination). Do you face religious discrimination at your job? Are you being denied employment because of your religious beliefs? Have you been denied an accommodation for your religious practices? The Law Office of Yuriy Moshes, P.C. represents victims of workplace religious discrimination in the greater New York City area including all the boroughs of New York City (Manhattan, Brooklyn, Queens, the Bronx and Staten Island) as well as Northern New Jersey, upstate New York, and Long Island.Call the Law Office of Yuriy Moshes, P.C. for a free consultation to learn all of your options.